"Oooah! Oooah!" 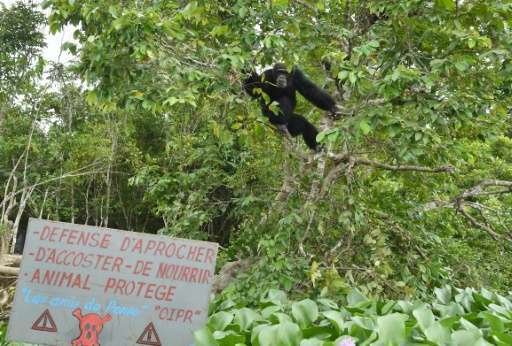 Screeching to see visitors on the forested "Chimpanzee Island" in Ivory Coast, Ponso is the last, lonely survivor of a colony of 20 apes who mysteriously died or vanished. 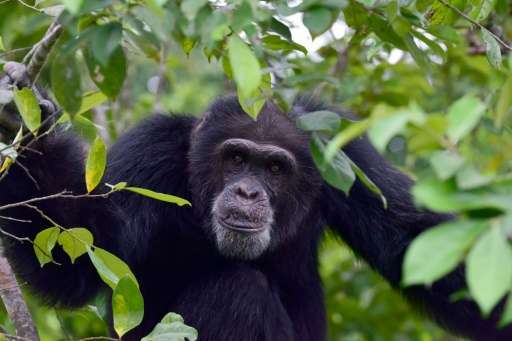 An effort is under way to keep Ponso alive and well in a west African country where the ape population has plummeted by 90 percent in just two decades. Since August 2015, the association Les Amis de Ponso (Friends of Ponso) has paid for the animal's food and for a dedicated carer, Germain Djenemaya Koidja, according to a wooden signpost near the landing stage and the website sosponso.org. Since then, the animal has been "the world's loneliest chimp", as SOS Ponso puts it. 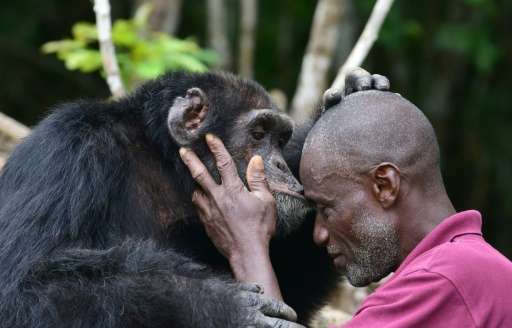 Ponso's dedicated carer Germain Djenemaya Koidja says the ape is "like my child"
"Ponso is like my child. I don't want to see him go... I'm making a call to have someone send me another female," says Koidja, whose family specialises in primates, from his father down to Junior, his 21-year-old son. 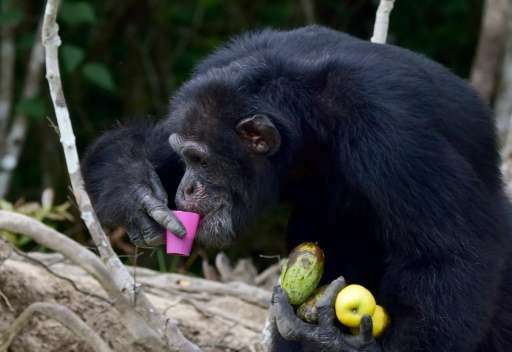 The chimpanzee's isolation has also moved Francoise Stephenson, the Franco-American owner of a hotel in Lahou who has become the leader of a rescue committee. "I have accepted the role of intermediary between well-wishers and Germain," says Stephenson, who is in her 60s and has come to know Ponso well. "During my last visit, we exchanged kisses and praise, he put his nails in my ears and then my nose," Stephenson says. "I left the island with the impression that I was coming down from another planet." Ponso's fate has been taken up by the new African Primatological Society (APS), which held its first congress this year to respond to a catastrophe that may see more than half of Africa's primate species doomed to disappear. "Ponso's story is rather touching," says the APS president, the Ivorian Inza Kone, who is also director of the Swiss Centre for Scientific Research in Ivory Coast (CSRS). "A plan to transfer (the ape) to a sanctuary in Zambia was mooted by NGOs to end his solitude. But Ivorian authorities refused, arguing that Ponso was a non-transferable Ivorian citizen," Kone adds. Ponso's salvation has become a textbook case for African primatologists confronted with poaching, deforestation and the need to mobilise resources to help animals. "From a scientific and even ethical point of view, it's clear that Ponso must be brought out of this situation of isolation, as soon as possible. There are two methods, sending him company or taking him somewhere else," Kone says. "These great apes are cousins with whom we share 80 percent of our genes. A single family lives in a very large territory (25 square kilometres, 9.6 square miles) and can travel 15 kilometres (nine miles) per day. All along the route, it eats and leaves waste and grains that grow to make the space green again," says Bassirou Bonfoh, chief director of the CSRS. Most people see the creation of a chimpanzee sanctuary as the most viable solution. "The sanctuary will reproduce the natural life setting of the animal and enable him to be in contact with his fellow apes," Kone says. "Ponso is the torchbearer of this initiative to create a sanctuary in Ivory Coast," Kone says. "We have to hope that the efforts to set it up get there before it's too late."